For anyone who loves to spray tan it can be difficult to get to a salon all the time. It can get expensive too. But you don’t necessarily want to stop tanning, right? You want to get the great look you expect and you want to do it more easily. That’s where these spray tan machines come in. If you get the right one you can get the look you want and you can do it without having to go to a salon all the time. That saves you money and it saves you time. Includes Tent: Does the system include a tent to keep the rest of the space protected while you’re using the machine? This can make it easier to get undressed and ready to use the machine that you’ve chosen too. Pieces: How many pieces are you getting? Is this something you’re going to have to assemble in order to have it ready for you? Will you be able to just take it out of a box and get started using it? You’ll want to know. 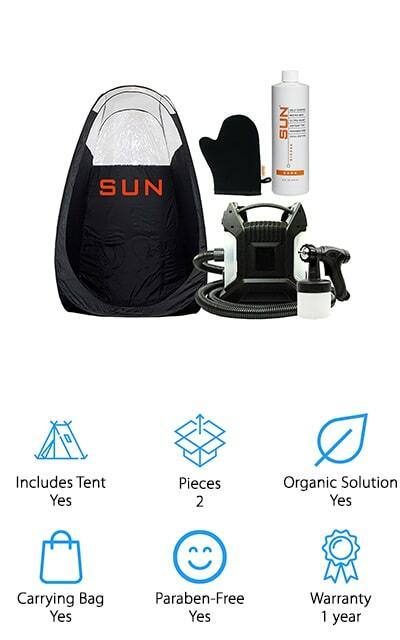 Organic Solution: What type of solution is being used to give you that tan? Is it organic or are there chemicals involved? This is about your health and about your personal preference when it comes to skin care. Carrying Bag: Is there a bag included that lets you take the system with you where you want to go? This can make it easier to use even if you’re going to be traveling or if you just want to have a bit more versatility. Paraben-Free Solution: This is another personal preference and it’s something to carefully think about. After all, parabens have all different uses in products but they can have different reactions for your skin too. Warranty: What kind of warranty do you get on the system? After all, you want to make sure it’s durable and going to last. The longer the warranty the more the company stands behind the product in case of problems. Plenty of people pay a lot of money for spray tanning or going to a tanning booth. By getting all of the items you need at home you can actually make sure you’re still getting the tan that you want but without having to spend so much time and money. These machines are going to make the process easier for you. Plus, we’ve done the hard part so you don’t have to worry about research or anything. Just take a look at our top picks and see which one is going to work for you. 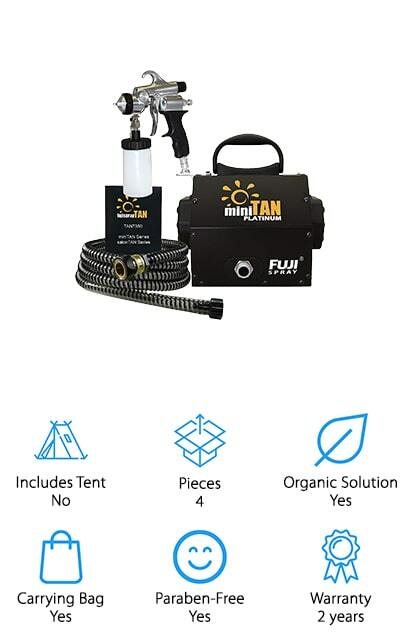 When you want a spray tan machine for your own use you want something that gives you everything you could possibly want. Our top pick is definitely going to do that. You’ll get the turbine unit, a long hose, cups, and lids, spare parts and of course the tent you’ll need to get things done. 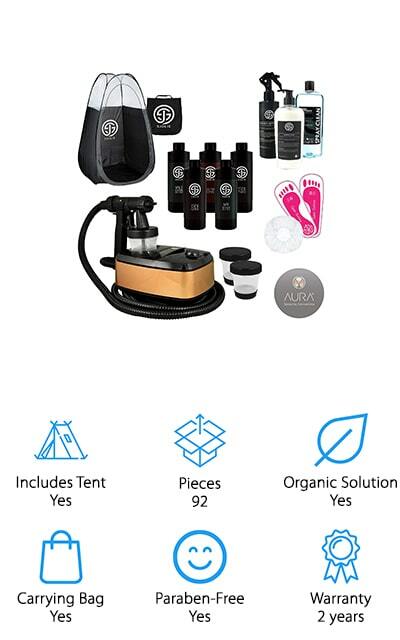 On top of that you’re going to get the tanning solutions in a range of different shades to match your personal needs, cream, a cleaner for the spray tanner, foot pads, a carry bag and a whole lot more. What that means is you’re going to have plenty to keep you looking your absolute best. With this system, you get to make some of the choices for yourself and you’ll be filling the spray gun with the shade of your choice. You’re also going to be using a paraben free and organic solution that you can feel great about on your skin. You want an organic spray tan and that’s what you’re going to get with this system. The entire thing is organic and paraben free, which means you don’t need to worry about the added chemicals that you’re putting on your skin. 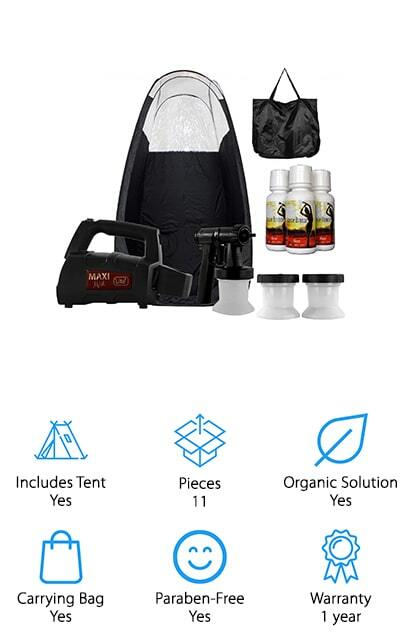 It comes with everything you need to get started including a tent, the spray gun, the solutions, and even vials to mix it all in. You’ll also have a carry bag that makes it super easy for you to take everything with you on the go. Available with a range of different tent colors, this is one you’re going to have some fun with. Choose between horizontal or vertical patterns and even make sure the flow is just the right speed for you. There’s a 1-year warranty included and you’ll even get a non-stick needle to make sure that the spray gun doesn’t clog while you’re using it. Here you get one of the best spray tan machine options you’re going to find anywhere. It comes with a guide to the entire program as well as the spray gun you need to get going. You’ll also have several different solutions so you can mix up the one that’s right for the shade you want. On top of that, you’re going to be more than prepared to start with the organic and paraben free solution that’s included in the set. That means you can feel better about the qualities of the formula. With the set, you’re going to get a carry bag that makes it a whole lot easier to take with you whenever you decide to go out. There’s also a 1-year warranty that lets you know it’s going to continue working just the way you expect. 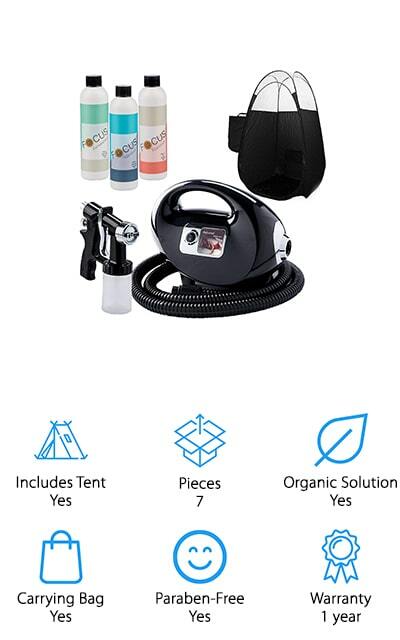 With this home spray tan machine, you’re getting absolutely everything you could possibly need. You get a tent to spray down in. You get the spray gun, the solutions, the prep spray, foot pads and a whole lot more. Even better, the spray gun is fully adjustable, letting you choose the flow level and the spray pattern. You’re also getting solutions that are fully organic, paraben free, non-GMO, sulfate free and all natural. That means you can feel great about using them and you can feel comfortable that they’re not leaving anything you don’t want on your skin. The solution is even vegan and nut-allergen free as well as having absolutely no artificial fragrances. All of that makes it safer even for those who have allergies or more sensitive skin but what to have a great tan at the same time. Here you’re not getting quite as many pieces, but you are getting a professional spray tan machine that can definitely get the job done. The machine even includes a heat dissipation box to let it run even longer but still stay cool. On top of that, there are a quiet turbine and even noise reduction covers for your filters. The air reduces the overall sound as well. All of this means you’re going to have no problem using it even when you want to keep things quiet for those around you. 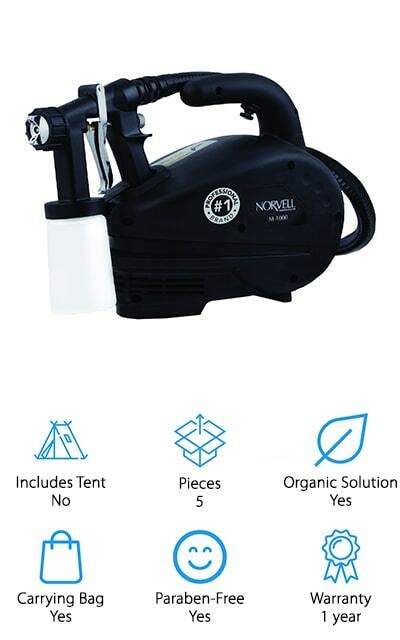 The solution is completely organic and paraben free and the machine comes with a 2-year warranty on the parts and everything. You’re going to get a carry bag to keep everything in and you can adjust the fluid spray and the flow of it. All of these things together mean that you’ll have absolutely no problem getting the great tan you’re looking for. You can get one of those spray tan brands that you know is going to work and give you the highest quality products right here. This product gives you completely organic and paraben free solutions in several different shades, so you get the perfect shade for your preference. You’re also going to get a tent to spray yourself in and the entire machine that includes flow rate adjustments and pattern adjustments. Everything you need for the entire process of your spray tan is included right here. You’ll have recessed gun holders right on the machine as well, which means that everything can be put together quickly and easily and stored away as small as possible. Plus, you get a bag that makes it easy to carry along with you wherever you go. Whether you want the best spray tan for pale skin or darker skin or something in between this is the way to go. It comes with a 2-year warranty that lets you know it’s durable and long lasting. Not only that but you get all the pieces you need to get your ideal spray tan. 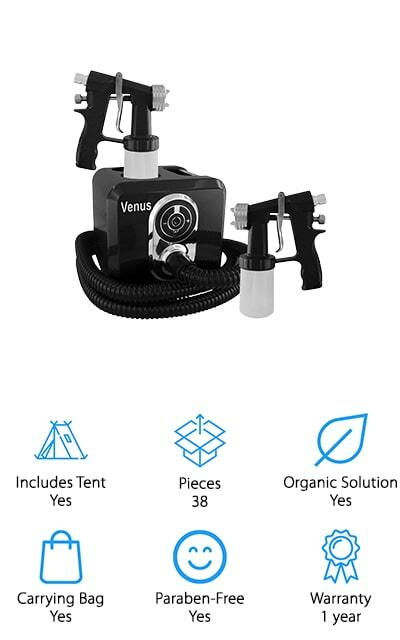 It comes with the tent, the machine, the spray gun, solutions in different shades, mixing vials and a whole lot more. All of that means you can trust you’re getting a great look and that you can get the machine to work for you. Even protective gear like foot pads and a hair net are included in this set and so is an online link that will help you better understand exactly what you’re doing. That way you can make sure you’re getting the tan you want the first time. 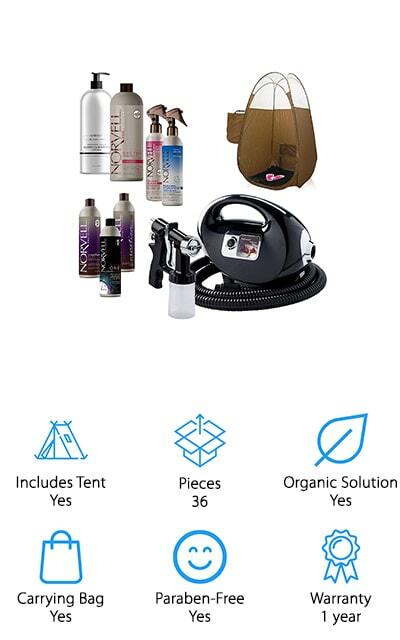 You can get the best professional spray tan right here, with all the gear you’re going to need. 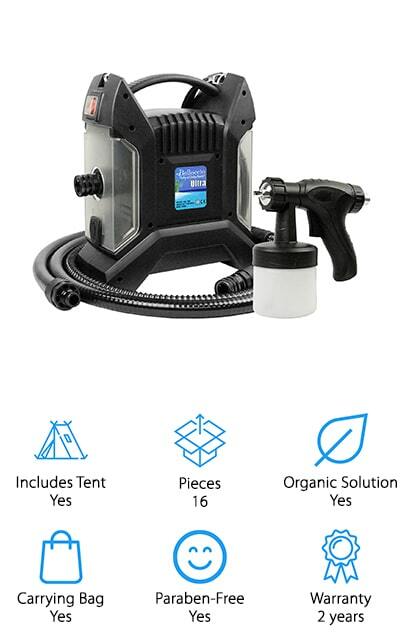 It comes with a tent as well as the machine and spray gun that you need. You’ll also have a hose to get more distance and a glove to make sure you can mix everything up without having to worry about extra formula getting on you. The organic and paraben free formula is high quality and is safer to use on your skin than many of the other options you’ll find out there. It’s even designed with all-natural ingredients to give you great looking skin. You’ll be able to get everything set up and get started on your first tan in no time at all, plus you’ll be able to adjust everything you need to make sure your tanning process is more comfortable, then just pack it up in the included bag and you’re ready to go. The best spray tan for fair skin is one that’s going to have you looking your absolute best, and that’s not going to take much at all for this machine. 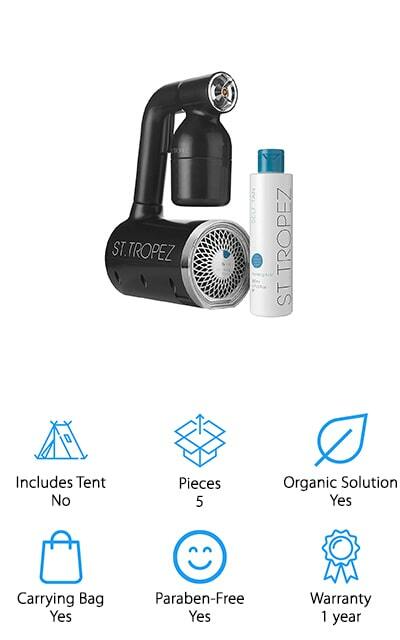 You get a tent as well as the solutions that you need to choose your ideal tan shade. The solutions are even organic and paraben free so you can feel great about using them and won’t have to worry about chemicals and other additives that are soaking into your skin. Complete with a 1-year warranty, this set is going to make getting that tan a whole lot easier. You’re not going to get a whole lot of extras here, but you are going to get a natural looking tan that doesn’t leave you with streaks, spots or lines. Rather, you’re going to have the minimal design that you want with the simple to use process you need. Our budget pick is a high-quality system that’s going to get you started off in the right direction. You’re going to get the spray gun, the hose for distance, a solution bundle, a tent to do the job and a carry bag for everything you need. You’ll be able to mix the solution that you want most for your shade preference and then you can get the whole process done right on your own. You won’t need to worry about a thing. The formula itself is actually enriched with vitamins so that it leaves your skin looking even better than ever. You’ll get a natural glow with naturally occurring DHA. Not only that but you don’t need to worry about parabens because the solution is completely paraben free and it’s fully organic so you can enjoy using it for yourself.